I am working with the banding, and have cut the 4 pieces about 25" long. I have the 9" marked on front, back and both sides, but the banding isn't long enough to go from one place to the next. Is the top of the banding (the "V") supposed to be at the 9" mark, or the bottom or the middle? The pattern indicates that the top of the banding should be at the 9" mark, but the banding would need to be cut much longer than 23". The directions say the banding should be in a square around the neck, but the diagram shows more of a "V" pattern. Also, when sewing the banding at the shoulders, do you have any suggestion for neatly hiding the seam? I am surging the edges, but do you just tuck them under as neatly as possible? Or do you have a trick I can use? The nine-inch mark you are referring to is in the middle of the banding, neither the top nor the bottom. 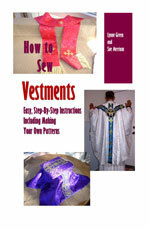 Generally, when I make the chasuble, I place the banding on it before cutting the banding. Since apparently you have already cut the banding, you will need to place it at the eight inch mark instead. When looking at the front of the chasuble, you only see a V. However, lay the chasuble out flat on a table, and you will see the square. The corners of the square point down in the front and back and toward the arms. Hopefully this make sense to you. To make a neat seam, you will need to fold it under and hand-stitch it in place. Hope this helps, and God bless you in your sewing efforts.